Last Saturday, Dereck 'Del Boy' Chisora (15-3 9KO) had an open workout at the SENI show 2012 which was held at the Excel in London. 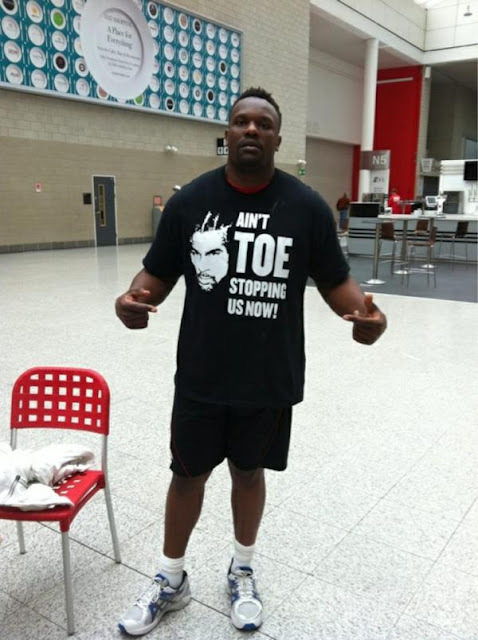 As you can see from the image above, Chisora is in good spirits six weeks before he steps into the ring with David Haye. In the interview, Chisora says he is only at "49%" when asked about his condition. Well at "49%" he looks to be in good shape, so in six weeks time we can expect him to be in the best shape of his life. After seeing how serious Chisora is taking his training, it's safe to say that we can expect a very good fight between Dereck Chisora and David Haye on July 14th. Chisora Vs Haye - Who are you picking?